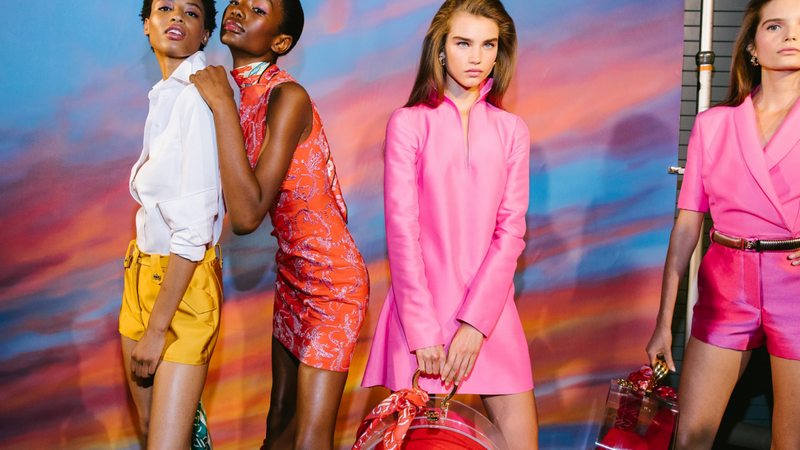 Much has happened since the last round of fashion weeks in March. With the #MeToo movement inspiring many individuals to stand up against their predators, a lot of industry heavyweights have fallen. What started in Hollywood after the Harvey Weinstein scandal, trickled down into the fashion industry, where models soon too stood up and called it for what it was. 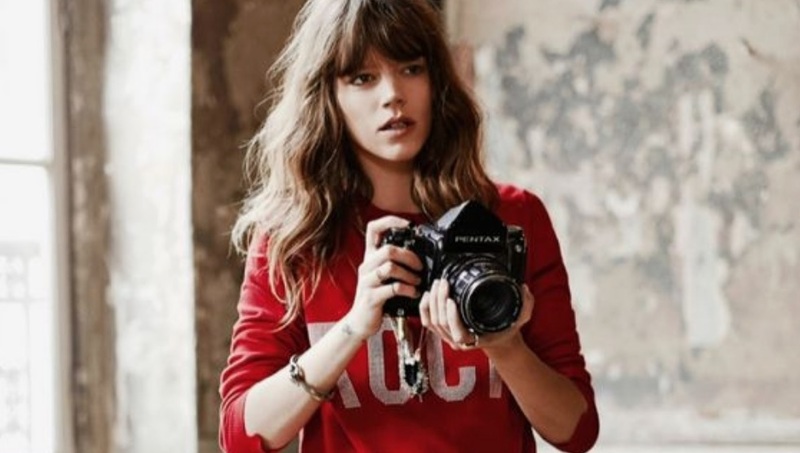 Unsurprisingly, we saw a lot of models, both male and female, come forward with traumatizing stories involving photographers Mario Testino, Bruce Webber & Terry Richardson. 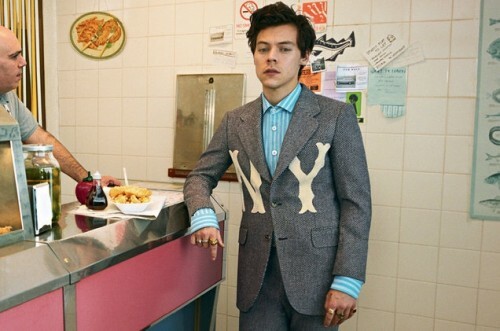 Finally after years of speculation, they were held accountable for their actions; all banned from shooting with publications under Conde Nast ‘for the forseeable future’. It became clear who stood on what side in the middle of all of the exposure. 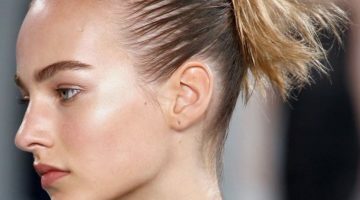 Supermodels like Sara Sampaio and Cara Delevigne came forward with their own experiences to show support. Magazines published anonymous stories as a way of warning others. But some magazines, like Numéro Magazine, published the opposite. 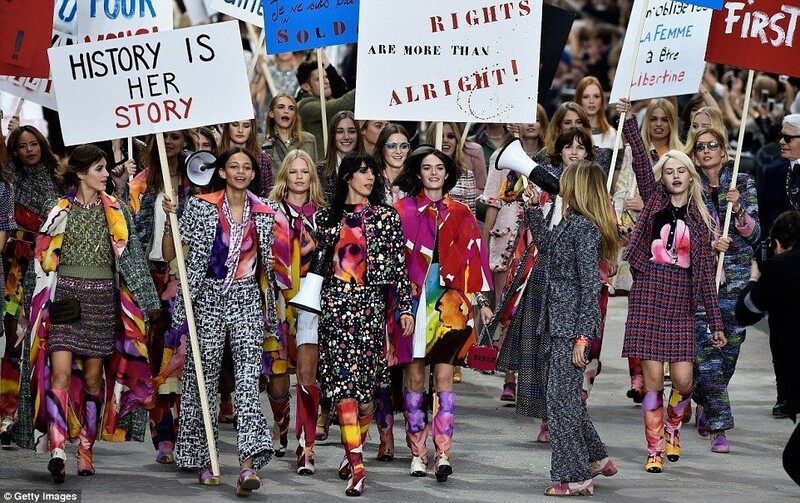 The head creative director of Chanel, Karl Lagerfeld, shared his distaste for the movement with Numéro. He pushed for women to “join a nunnery,” if they didn’t want their pants pulled down. Lovers of Chanel were conflicted after this interview was published. A lot of models, including the Hadid sisters, made no comments on their dear friends’ words. In fact, Karl seemed to emerge unscathed. However, some good came from the aftermath of Lagerfeld’s interview. 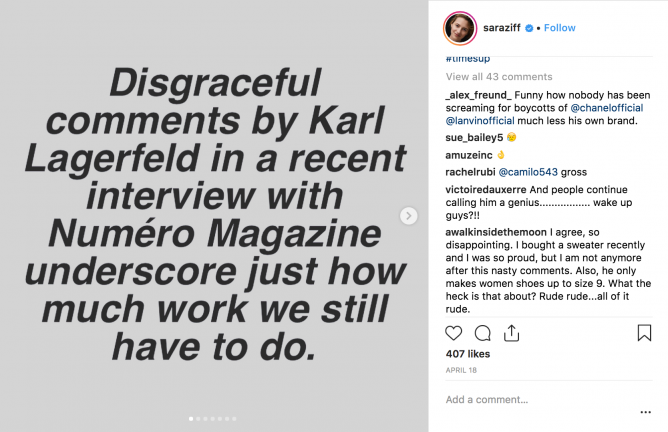 Sara Ziff, the founder of The Model Alliance, released a furious statement about the couture titan’s beliefs. 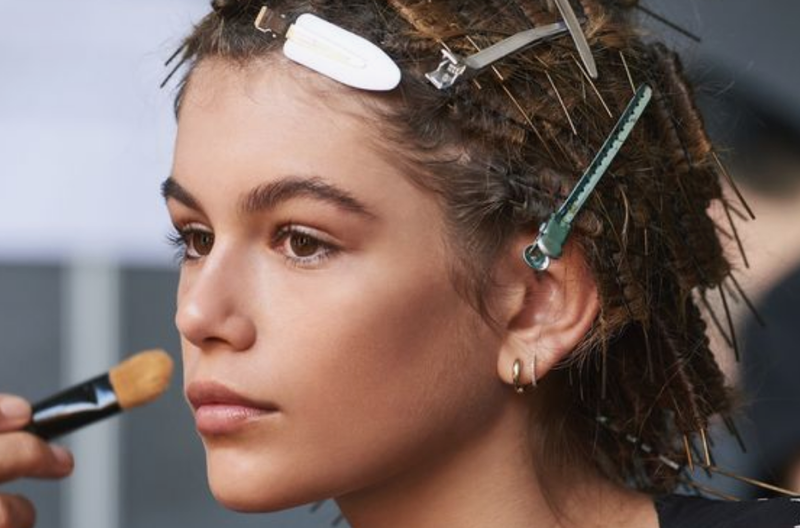 The Model Alliance (@modelallianceny) declared his assertions as “outrageous,” to over 14K followers. Many news sites and fashion magazines agreed with Ziff’s feelings, and spoke to defend her and her organization. Since reporting on her commentary, Women’s Wear Daily online has posted many articles in support. 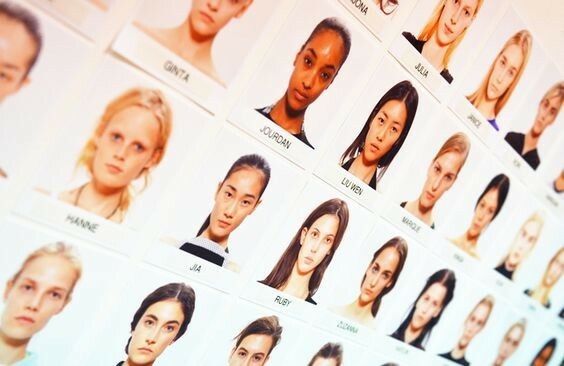 Over the past year, The Model Alliance has become one of the most known organizations in the post-#MeToo world. The organization was founded in 2012 as a way for models to have a voice in the industry. Now, it has grown to harbor thousands of voices- including designers, agencies, and casting directors. It is open to all members of the industry, no matter the age, location, or gender. I found The Model Alliance’s Instagram page last year, after a friend of mine had their story of sexual harassment posted there. Instantly I began to stalk their page, following right after. There were hundreds of stories from girls just like me, showing their hardest times and the triumph they find after. And it’s only gotten better since for them. 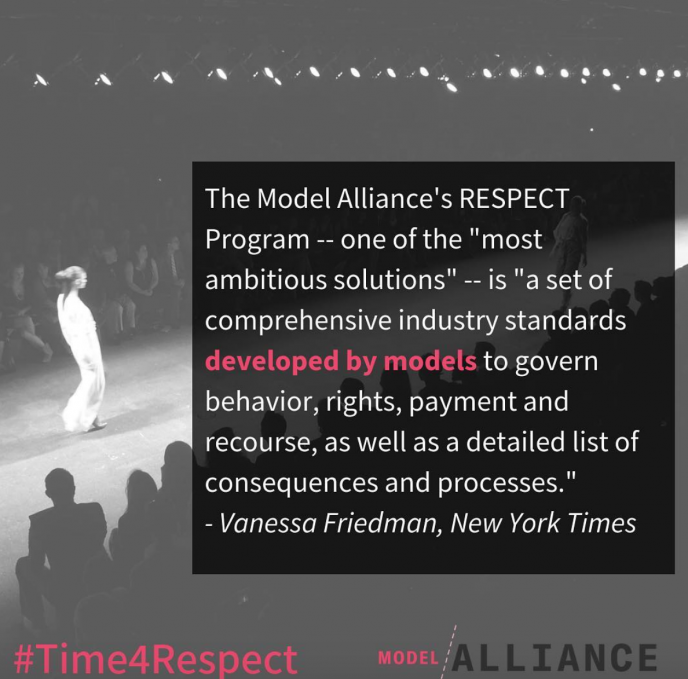 The Model Alliance recently begun posting about their RESPECT Program: a legally binding contract against the sexual harassment of fashion models. Their currently working on getting this necessary piece implemented everywhere in the industry. The New York Times has written about the program in hopes to gain more and more attention towards it. As a young women in an industry still full of dangerous predators, it’s comforting to know there is a place to find assistance. It makes me feel much more safe knowing that there are people working towards a better working environment. Also, it’s cool to be a part of their journey and see ideas put into action. Us models now have these opportunities to make real change. Sara Ziff was one of Fast Company’s Most Creative People in Business- along with the Parkland students who started the March For Our Lives. Both organizations, while fighting in different fields of change, still have the same idea. Their success relies on the supporters. It’s as important to march as it is to share your stories, and be a part of the change. You can become part of The Model Alliance here: https://modelalliance.org/donate-2. 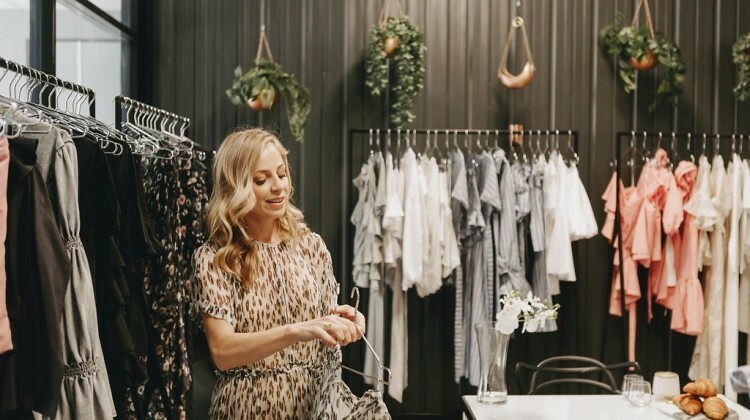 It doesn’t matter if you work in the world of couture or not. Anyone who wants to make a change in such a publicized field can help. And although Karl Lagerfeld has been seen out in New York City for this 2019 fall fashion week, it’s important to not focus on him. Instead, we need to put our united energy towards passing programs and contracts that will stop powerful figures like him from sending any women of strong-mind to a nunnery. If I were Karl, I’d start praying.